Category Archives: Remain in the Lord. Greetings to all in the most precious name of our Lord and Savior Jesus Christ. This Particular text was really hard for me to understand and I read about many times to know what Jesus was telling to Peter here. I always had a desire in my heart that one day my Lord will reveal this to me- and on the sweet evening of 03 Aug 2010 while I was meditating through this passage God opened my eyes and made me to understand his word. Let this message open your eyes and enable you to grow in Christ. Let me simplify the text so that you can understand, it says “If I desire that he should remain till I come, what is that to you?” this was said by Jesus to Peter. When Peter turned around and motioned John and asked about him. Jesus said that his will is that John should remain till he come. Jesus was not saying that he will not die in fact his will towards John was that he must hold on the Love and Faith till he comes. If God desire about John that he must hold on till the end then how much more we should. God’s desire with us is to remain where he has put us until he come. He does not want us to wander here and there but want us to remain in him until he comes to receive us. John ends the Gospel by portraying the desire of Jesus Christ to everyone who is following him. John has influenced me with is loving approach towards Christ, I just made a footnote about the disciple who followed Jesus. Out of the twelve one was a Devil (Judas Iscariot), Philip who did not know Jesus (John 14:9), Thomas who do not know the way and do not know where Jesus is going (John 5:5), many of his disciples went back and walked with him no more (John 6:66), Peter who denied Jesus inspite of all this one choose to lean his head on bosom of Jesus and stand near the cross. His name is John. God spoke to me other day why he himself appeared to John in the island of Patmos and why he did not send his angel? The day when all denied Jesus and betrayed him, it was John who stood by till the cross, he remained in the Love of Christ till the end, so God said to himself I will appear to this man who was with me till the end and will deliver him out of Patmos. If you choose to remain with the Lord in your thick and thin, he will be your keeper, he will be your tower and your shade. John stood when all scattered, John leaned when Judas left. No matter what the world say but you choose to cling onto Jesus. Some of you are interested to see how pastor’s life is, how that denomination is. God has not given you the license to judge others. You follow Jesus and remain where God has put you. God will judge! God’s will to the Adam and Eve was that they should remain where he has put them but due to sin they were throw out and was forbidden to eat from the tree of Life but when I read in Revelation 2:7 to him who overcomes I will give him to eat from the tree of life which is in the midst of paradise of God. If we remain in Christ we will enjoy the privilege of eating from the tree of Life where Adam and Eve were forbidden. The church of Ephesus has left the first love so God reminds them to return from where they have fallen and remain where they were planted. God wants us to remain in the First Love. What is first love and why it is important for us to come back to the first love? First Love is something special with more sincerity, faithful, caring, obeying, more attached but as the year goes this love becomes cold and now there is no sincerity like before, now their friction between the two parties. So what we should do now to come back to the First love? Love Jesus daily. We all love Jesus but my question do we Love him like first when we accepted him? God did not tell Ephesus that they do not love but he said they had left the First Love….Yes we have Christians who love Jesus but has left the first love. Do your relationship daily with Jesus is getting weaker or stronger? Jeremiah 2:2 says about the Love of your betrothal. Like a Husband loves his wife in the days of engagement but for most of us this love slowly and steadily turns like hot water slowly turns into cold water. God is not promoting Luke warms but he wants someone who still holding him even in hardships.God wants us to remain in his love, he wants us to remain in his faith, he wants us to remain in his word. Are you there or drifted away from where God has put you? If yes! Today is the day for you to return. Did John remain till the end? Yes remained in the love of Christ until he was put in the boiling oil, he remained until he was banished to Patmos, he remained until he was tortured and persecuted, he was faithful and was in the blanket of Lord’s Love until the point of Death. And God says he who overcomes I will not blot out his name from the Book of Life, I will confess his name before my father and before his angels, I will make him a pillar in the temple of God, and he shall go out no more. And I will write on him the name of My God, the New Jerusalem, which comes down out of heaven from my God. And I will write on him My new name. What a privilege to us if we choose to remain in the Lord. The present time sufferings are only for some moment but remain in the love of God, keep the faith till the end. Paul says I have fought the good fight, I have finished the race, I have kept the faith. He has fought, Finished and kept…this shows he remained where God has put him. God’s will with every follower is that he must Fight and not give up, he must finish the race with endurance and keep the faith till the end. My prayer to God if I die before his coming I must get a good end. Like Paul, confident to say that I have Fought, I have finished and I have kept. Let us continue in faith, firm and established and not move from the Hope. Colossians 2:6 says So then, just as you received Christ Jesus as Lord, continue to live in him, rooted and built up in him, strengthened in the faith as you were taught, and overflowing with thankfulness. 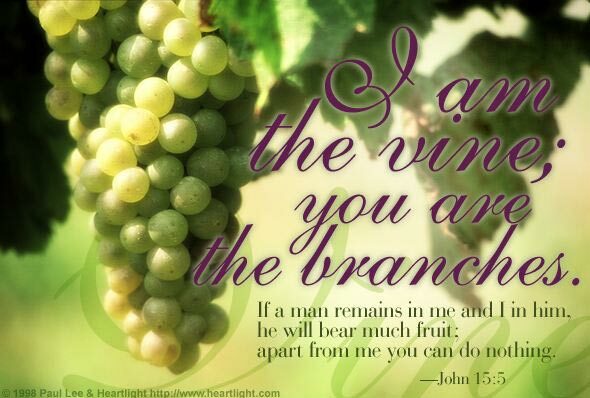 If we continue to live in him like the branch is attached to the vine and rooted and built up in him- we can remain in the Lord. Genesis 26:3, 6 and 12 Here we can see Isaac in the days of great famine was trying to go to Egypt like his father Abraham. Some of the folks like to follow traditions and footsteps of forefathers that’s why they do not give ears to Gospel. But God appeared Isaac and told him to remain in the land which he tells. So Isaac remained where God told him and in the same year of Great famine Isaac sowed and reaped hundred folds and God blessed him. I would like to share many more characters here but I have limitation. One of them is Ruth who clings with her mother in law and chose to serve the Living God and we know how God blessed her. John 15:5 says If a man remains in me and I in him he will bear much fruit; apart from me you can do nothing. Cling unto Jesus so that we bear much spiritual fruits. Let us remain where God has planted us. The time is near and we will see the son of man coming with the Clouds….keep the faith, remain in the Lord. 4 Comments	| posted in Remain in the Lord.